UNISON general secretary Dave Prentis is due to show his support this evening (Tuesday) for homecare workers in Birmingham who have been involved in a year-long dispute over their pay and working hours. He is attending a solidarity rally in the city to pledge his continued backing for the staff who have so far taken more than 50 days of strike action in their battle with Birmingham City Council. Up to 200 care employees face having their working hours and earnings slashed by the Labour-run council in a bid to cut its budget. 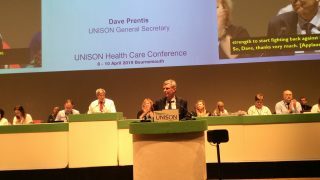 Dave Prentis will call on the council to end its threats to staff, saying: “UNISON has been standing by these incredible care workers every step of the way as they fight to maintain their hours and pay. “This is a fight caused by years of government spending cuts, which have taken their toll on council budgets across the land. But councils, even though they face difficult decisions, should not be singling out some of the lowest-paid workers on their payroll. “Millions of public service workers have seen their wages slashed and jobs axed during the austerity decade. “These care workers are looking after vulnerable members of society. If they are forced to leave their jobs because of council-imposed pay cuts, there’s a risk that there won’t be enough staff to allow the elderly across Birmingham to stay in their homes. Mr Prentis will continue: “This is a fight which isn’t just about these incredible women or those they care for. It’s about the very future of public services themselves, about whether we treat those who do the most vital work, with dignity and respect and about the future of our country and our communities”. Care workers in Birmingham could lose around £4,000 under the council’s proposed reductions to their working hours. At one stage in the negotiations, some of the affected workers stood to lose up to £11,000. – The TUC-organised rally takes place at 6.30pm today (Tuesday 29 January) at Birmingham & Midland Institute, Margaret Street, Birmingham B3 3BS. Also speaking is president of the TUC Mark Serwotka.